In a superb advert for Southern League football, Brakes survived a stern test of character to rack up their third win in four, writes Paul Okey. An explosive opening which saw Brakes go one up and Tony Breeden lucky still to be on the pitch set the tone for a breathless encounter which fizzed and crackled along until a spate of late substitutions took the sting out of the game. The home side were unchanged from their trip to Histon and made a confident start with a sweeping move handing them a fourth-minute lead. Lee Moore was played into space on the left flank and the wideman expertly laid the ball into the path of Jack Edwards who did not have to break stride before sidefooting confidently past Jamie McAlindon from the edge of the box. 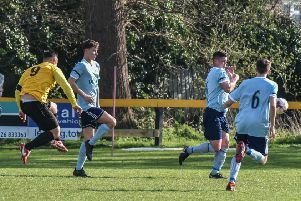 Kettering’s response was immediate, with Jamie Hood in the right place to divert Courtney Baker-Richardson’s header for a corner from which Breeden produced a superb reflex save to somehow divert Brett Solkhon’s point-blank header on to the bar. A goal still looked the most likely outcome but the ball rebounded off the woodwork and on to the line before being cleared. Seconds later, Breeden was again a relieved man after racing from his box and scything down Jevani Brown, with referee Mark Griffiths deciding, after consultation with his assistant, that it was not a clear goalscoring opportunity. The action remained frantic with the Poppies slowly asserting themselves. But with Joe Magunda providing a solid presence in front of the Leamington back four, chances were at a premium. In fact, it was Leamington who were next to threaten, with McAlindon pulling off an instinctive save with his feet as he raced across goal to deny Ben Mackey following good work from Edwards on the byeline. Edwards was again at the centre of the action in the 34th minute, with shirt-tugging on the midfielder handing Brakes a free-kick in a promising central position 25 yards out. McAlindon took an age to position his wall but it was in vain as Richard Taundry curled an exquisite free-kick past the motionless keeper. Breeden, who had tested the patience of the referee and invited the scorn of a sizeable Kettering following with some dubious time-wasting tactics, was to show the other side of his character three minutes before the break after being sold short by a backpass. With Brown bearing down on him, the Brakes keeper produced a neat stepover to evade the striker and avert the danger. A tame Brown shot brought the first-half action to a close with Poppies manager Marcus Law keeping his players out on the pitch long after the half-time whistle blew before retiring to the sanctuary of the dressing room. Any suggestion the former Racing Club boss had just been pointing out the impressive night sky in those on-pitch moments were quickly banished as the visitors, now boasting a three-pronged frontline, tore into the visitors after the restart. Their first goal, however, despite being expertly taken by Saul Williams, was entirely avoidable with Brakes fluffing the chance to clear their lines on more than one occasion. The accuracy of Williams’ finish could not be denied, though, with the winger arrowing his drive across the despairing dive of Breeden and into the bottom corner. Three minutes later, Kettering were level. Again, Brakes failed to clear, allowing Brown to weave around two half-hearted tackles in the box and at the prospect of a third, take a tumble. Referee Griffiths was quick to point to the spot and Andrew Gooding confidently sent Breeden the wrong way to restore parity. Having got back on level terms, Kettering were dealt a blow when Baker-Richardson was forced to limp off, replaced by Nick Wright, who had joined the club earlier that day. Just past the hour-mark, Leamington were back in front with another goal of the highest quality. Rob Ogleby released Ben Mackey on the left-hand side of the box and despite the striker’s touch appearing to further reduce the angle, he produced a bullet of a shot that whistled past McAlindon and inside the far post. As space opened up, Dominic Langdon headed wide from a corner for Kettering, while an excellent run from Lee Moore ended in a cross which was crying out for a finishing touch. Neat play from the visitors then saw them scythe through the heart of the Leamington defence, with Williams unable to crown the move with a suitable finish, grazing the bar from the edge of the box. Mackey was replaced by Will Green with 15 minutes remaining and the substitute was straight into the action, dragging a shot wide after being released by Moore. Kettering brought on former Brakes Justin Marsden and Elliot Sandy while Ross Oulton came on for the influential Taundry and the substitutions only served to disrupt the tempo of the game to the benefit of the hosts. Jake Jones was Leamington’s final introduction and his impact was almost immediate, with McAlindon doing well to deny him at close range as Kettering committed men forward. There was still five minutes of injury time for Brakes to negotiate and it was not without its alarms, with Williams seeing a shot charged down and Langdon’s header eliciting vociferous handball claims from the visitors. The referee, with several bodies between him and the alleged transgressor, remained unmoved, however, before the final whistle at last allowed both sets of players and fans to catch their breath. Brakes: Tony Breeden, Ben George, Connor Gudger, Joe Magunda, Jamie Hood, James Mace, Rob Ogleby (Jake Jones, 88), Richard Taundry (Ross Oulton, 80), Ben Mackey (Will Green, 75), Jack Edwards, Lee Moore. Subs not used: Lewis Fenney, Kieren Westwood. Kettering: Jamie McAlindon, Richard Bryan (Elliot Sandy, 78), Dominic Langdon, Steve Kinniburgh, Gary Mulligan, Brett Solkhon, Will Grocott (Justin Marsden, 78), Andy Gooding, Jevani Brown, Courtney Baker-Richardson (Nick Wright, 59), Saul Williams. Subs not used: Enol Ordonez, Danny Harmon.